How do I unlock my Samsung Galaxy Note8 without a physical Home button? Are you trying to unlock your Galaxy Note8 but can’t find the Home button? No worries! We’ll show you just what to do. Read on to learn how to unlock your new phone. ➥ Instead of a physical Home button, the Galaxy Note8 now has an on-screen Home button that is always available. You can treat the on-screen Home button just like a physical Home button. Press it with the same pressure as you would a physical button to wake up your screen or access the Home screen. Can’t see the Home button? You can press the location of the Home button even when it’s not displayed. We’ve thought of everything. Note: If the function is not working, try applying more pressure with your finger on the screen. ➥ You can also set your phone to skip the lock screen entirely when you touch and hold the on-screen Home button. 4. Swipe to and touch Navigation bar. 5. Touch the slider next to Unlock with Home button. 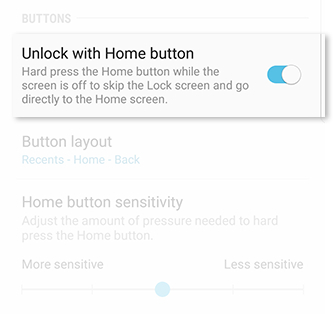 Note: You can also set how hard you need to touch the Home button to unlock your phone. 6. Touch and drag the slider under Home button sensitivity to the left to reduce the amount of pressure needed. Drag the slider to the right to increase the amount of pressure needed. 5. Follow the on-screen prompts to use your fingerprint to unlock. Note: There’s no place like home... er, the home button, that is. 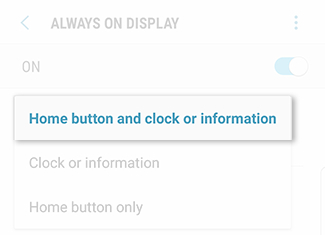 You can customize the Always on Display screen to show the Home button, clock, or both. It’s up to you. Follow along to learn how to set it up. 4. Touch Always On Display. 5. Turn Always On Display ON by touching the slider if required. 6. Touch Content to show. 7. Select the desired content. For this example, touch Home button and clock or information.